It Cosmetics Your Most Beautiful You is a 6-piece antiaging collection that truly gives you the power to be Your Most Beautiful You! It is perfect for anyone who wants to instantly conceal imperfections, diffuse the look of lines and wrinkles on their face, blur away pores from view, and achieve a more radiant looking, flawless complexion. Beginning Saturday July 27, 2013, at 10 p.m. for 24 hours only, The Shopping Channel’s “Today’s Showstopper” will feature these fabulous six must-have pieces that includes the cult favorite Bye Bye Under Eye Concealer in a Supersize plus a brand new launch - Vitality Lip Blush Hydrating Gloss Stain. Here's a look at what's included in the collection and some swatches. This cream hightlighter is infused with peptides, hyaluronic acid, hydrolyzed collagen, silk and Vitamins A, C, and E to harmoniously and effectively hydrate, condition, and nourish your skin while providing a healthy glowing sheen to the skin. This can be applied using the Heavenly Luxe Pointed Precision Complexion brush that is part of this set or can just as easily be blended in with fingers. 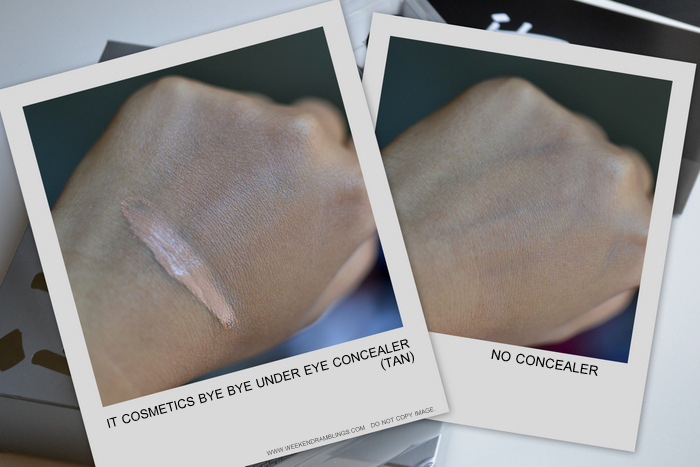 The product almost disappears into the skin, leaving just a barely visible glow. Developed in collaboration with plastic surgeons, this is a full coverage collagen treatment concealer (which can also be worn as your allover foundation). It is highly pigmented and never creases or cracks and is infused with hydrolyzed collagen plus Vitamin K! Use the Heavenly Luxe Dual Concealer/Foundation brush included in this set to apply. I picked the shade Tan. This color has some peach tones to it and is fabulous at neutralizing any greenish discoloration (I have used it to conceal some of the bluish veins seen on the back of my hand). A tiny amount goes a long way with this product. This is a pale pink gloss that is infused with nine ultra-rich butters and oils to drench your lips in hydration, plus collagen, peptides and hydrating hyaluronic acid. This multi-tasking miracle worker delivers high shine and concentrated pigment for color that looks like a gloss yet feels like a lightweight serum. The gloss stains the lips and provides long-lasting color that looks quite natural. Because it stains the lips, the color might appear a bit darker once the stain settles in the lips. This is a retractable pencil that features a sleek metallic design. The pencil comes in one color - a universally flattering brown that can be lightened or darkened depending on how much pressure you apply while drawing the line. The pencil feels quite hard and is perfect for drawing in natural-looking extra hair in feathery strokes. It Cosmetics makep brushes use synthetic fibers and come packaged in individual clear plastic tubes. The bristles are supersoft, and I haven't had any issues with shedding with the brushes that I have tried so far. The handles of these brushes have a rubberized finish and feel quite comfortable to hold. Use the Pointed Precision Complexion Brush to apply concealer/foundation on the more difficult to reach areas of the face like along the sides of the nose. It can also be used for precise application of highlighter. The dual-ended foundation/concealer brush can be used to buff in foundation for an airbrushed finish (the broader end) and the dome-shaped smaller end can be used to stipple concealer under the eyes. Overall, this is a fabulous way to try out some amazing It Cosmetics products - or to just stock up on your favorite shade of the Bye Bye Under Eye Concealer. Also included in the set is a small booklet that gives you an idea about how to use the various products. All It Cosmetics products are paraben-free, and the products carry the Cruelty-Free seal. I haven't yet had a chance to really test these products, so more detailed reviewed reviews in a bit.